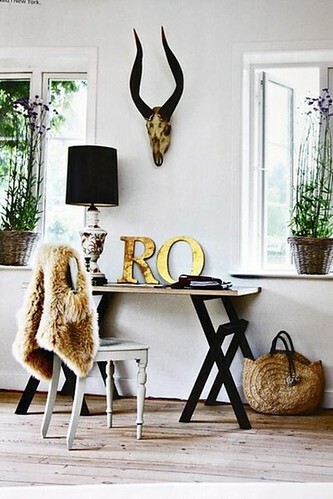 I love these gold "RO" letters and how they play off the black accents and fur vest in this space! This setting is a good example of how black and gold can be paired with a sparse white room and still add that bit of dark drama! Fantastic! Rooms like this always have me creating stories in my head like who lives here and what does R O stand for? In my mind it is for my Aunt Rosalie who like the horns of that animal just kicked cancers arse! She sure deserves a gold RO! I LOVE using typography in the home! Adds personalization without needing to monogram towels. I have some cast iron letters in my home, but the gold really adds a punch!